In June 2011 Google officially announced that they would no longer support Internet Explorer 7 (IE7). 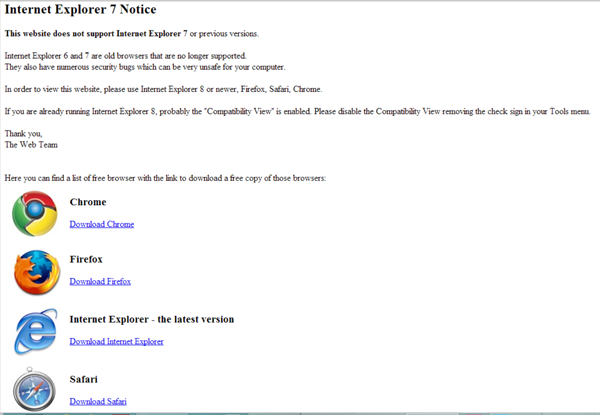 Older browsers like IE7, they said, just don’t have the “chops” to handle today’s modern web browsing needs. Instead, they urge people to update their browsers. A few months later, Facebook also announced that they would no longer support IE7. In fact, Facebook’s new Timeline feature doesn’t even visually render in IE7. As of January 2014, only 0.4% of the entire world’s Internet browsing population uses IE7. Only 9.8% use IE at all–but those that do have upgraded (for free) to newer versions of the browser As of Jaunary 2014 the most popular IE browsers are versions 8 (3.1%), 9 (2.3%), 10 (1.7%) & 11 (2.5%). The reasons IE7 is being abandoned by the biggest names on the web is because not only is it incredibly expensive to make websites and web applications work with IE7, but it is vastly flawed, does not follow industry standards, has security flaws and does not encourage the latest web progressions. Web Developers need to make sure that their products work on a myriad of browsers and devices–Chrome, Firefox, Opera, Safari and mobile browsers, for example. Designing for these browsers takes time. With IE7, there are so many unique quirks to the outdated, 8-year-old browser, that it takes an enormous amount of time to make a website or application support it. Due to these problems, and the very small percentage of people who even use the browser, we chose not to support Internet Explorer 7. The labour costs to support IE7 are so high that one online store in Australia is actually charging a tax on people who make purchases from their website using IE7.As the BBC reports, CEO of Kogan.com, Ruslan Kogan, said that he decided to charge the tax because his IT team had “become pre-occupied with making adaptations to make pages display properly on IE7″. I was constantly on the line to my web team. The amount of work and effort involved in making our website look normal on IE7 equaled the combined time of designing for Chrome, Safari and Firefox. There is a very simple solution to this problem with the 8 year old IE7–update your browser. It’s free, fast and easy. Updating your browser will increase your Internet browsing speed, allow you to use the latest web apps and, most importantly, your browsing experience will be better protected from evil people who seek to do you harm, since updated browsers have updated browsing security. On Easitill websites we have a browser detection setting enabled, which alerts people of the risks involved in using an outdated browser and gives them linkes to easily and freely update.